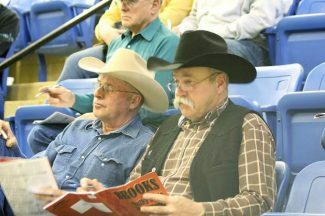 Tim Seim, Shadehill, SD and Wayne Weishaar, Lemmon, SD purchased Brooks bulls. 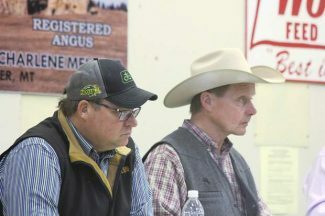 Steve & April and Ryan & Becky Brooks and their families offered up a another large volume of top top-notch bulls for their annual production sale held at Bowman Auction Market, Bowman, North Dakota on April 4. 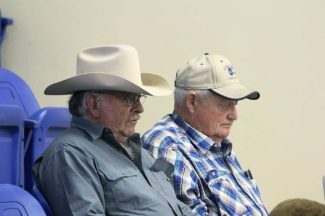 The sale started off with one of the largest offerings of commercial replacement heifers to sell this spring in the region. The heifers were all sired by Brooks bulls and came from the Brooks Chalky Butte Ranch and consigned by many of the top bull buyers in past years sales. All of these heifers were replacement quality. The selling price varied somewhat depending on the age and amount of flesh the heifers were carrying. The top selling draft of heifers were from the Gerbig Ranch, Amidon, ND and sold for $1,450 per head. The high selling bull for the day was lot 4, Brooks Discovery 5390, a Mar. 2015 son of VAR Discovery 2240 with epds of CED 7 BW 1.1 WW 69 Milk 36 YW 127 $B 147.81. This calving ease herd sire prospect had a 205-day wt. of 685 lb., ratio 113, 365 day wt. 1248 lb. ratio 112 and sold for $17,000 to Wade Wilson, Watford City, ND. Lot 10, Brooks Discovery 578 is a Feb. 2015 son of VAR Discovery 2241 with epds CED 15 BW -1.6 WW 64 Milk 37 YW 124 $B 157.73, 101 weaning ratio and 112 yearling ratio. River Run Ranch, Medora, ND was the buyer. Lot 13, Brooks Discovery 5316, a Mar. 2015 son of VAR Discovery sold to Brian Goven, Mercer, ND at $8,000. This is another super calving ease bull with epds of CED 10 BW -.1 WW 54 Milk 34 YW 101. Also selling at $8,000 was lot 31, Brooks Comrade 507, a Feb. 2015 son of Connealy Comrade 1385, also great calving ease with epds of CED 16 BW -4.2 WW 55 Milk 20 YW 100. Cole Miller, Scranton, ND was the buyer. Another top VAR Discovery son was lot 7, Brooks Discovery 5258 at $7,750. This bull had epds of CED 9 BW .3 WW 64 YW 117 Milk 34. Rodney Lutz, Hettinger, North Dakota was the buyer.